This 5 Micron Outer Filter is for the G0738 Hanging Air Filter. Its doing the job plus it keeps the warm air circulation. Filter works great and fits the air filter unit seamlessly. Will definitely purchase more in the future. 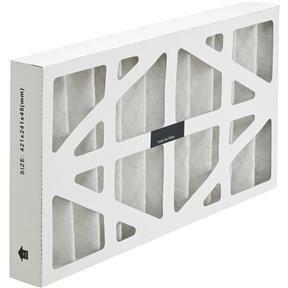 I bought this filter so I would have a replacement on hand for when the air filter needed it which by the way, I am very happy with. I have a small shop (20 X 30) attached to the house and the wife doesn't like it when I get dust in the house. This filter seems to be doing a very good job with keeping the dust down to a manageable level. Made big difference in air quality. Thanks for the quick service. I purchased 2 of these units for my shop and they work great! I certainly recommend for any work shop. Took forever to get these filters as they were on back order for months! But they did eventually arrive. I ordered a few replacements for my G0738 Dust collector. I would recommend these to always have a replacement on hand. I really like the filters, but I wish they were in a bulk package and had a larger surface area because they get dirty quick. Been using this product for 60 days so far and it is still doing great. Just have to blow it out when it gets brown and it works just like brand new. Filter is well constructed and fits the unit bit of an odd size cannot find them anywhere else. the item is as advertised. no surprises here. My shop is in the basement of my home, this filtering system helps to keep it quiet up stairs. This unit has done a great job of taking random dust out of the air in my small shop. I just bought this to have a clean spare for the air filter I just bought. They do what they are suposse to and they At a great price. I have a few extras on hand. Surely worth purchasing a couple to put away just in case.